Urban Outfitters now has its own in-house beauty brand, Ohii, and it's vegan, cruelty-free and affordable. In other words, you're going to want it all. Urban Outfitters is a go-to when it comes to clothing, accessories and apartment needs, mainly because its collections are already specially curated to make sure we're living our best and chicest lives. In other words, the brand makes keeping a creative and up-to-date lifestyle a little easier and, honestly, who wouldn't be down for that? 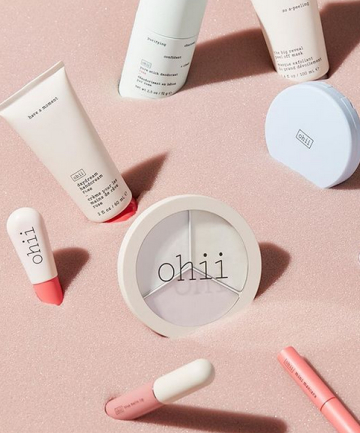 UO's beauty department is a good example since it offers only the best when it comes to makeup and skin care with cult brands like Mario Badescu, Milk Makeup, Ouai and many more comprising its quick, no-brainer shopping selection. And now the brand has even launched its own beauty brand to add to the mix. Introducing Ohii, Urban Outfitter's in-house makeup and skin care line. Ohii (pronounced "Oh, hi!") is here to reacquaint us with natural beauty. As UO stated in a preview, "Ohii fills in the blanks of every beauty routine with thoughtful products developed to work well with others. Readily accessible to all, both in stores and online, Ohii seeks to enhance natural beauty, not hide it." The line consists of gummy glosses, lip jellies, a mini mascara, a magic hair wand, glass powder and the list goes on. We don't know about you, but we're already certain we need all of the above. The range is also vegan, cruelty-free, paraben-free and gluten-free — not to mention affordable and Instagram-worthy. Click through to start shopping.